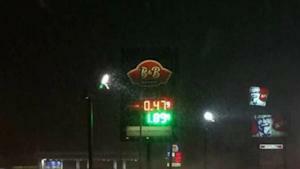 The price of gas hit a stunning low -- just 47 cents per gallon -- in Michigan on Sunday. Michigan was the first state to have gas under $1 in likely over a decade, Patrick DeHaan, senior petroleum analyst at GasBuddy.com, told ABC News today. A gas station in Houghton Lake, Michigan, hit the 47 cents mark after a price war between three stations in the town, DeHaan said. GasBuddy.com's data goes back to 2000 and DeHaan said he couldn't find any other averages that low in the U.S.
"This is something we don't see often at all or ever," DeHann said. "That's unheard of." DeHann said he believed the next lowest price in the country was about $1.29, at a station in Virginia. Gas prices in the U.S. are averaging at $1.889 today, down over 17 cents from last year's average of $2.061, according to GasBuddy.com. Low gas prices can likely be attributed to low oil prices, as oil supply stays high and oil demand stays low, DeHann said. The highest national average was $4.12 in 2008, DeHann said. In terms of individual gas stations, prices have gone as high as $6 a gallon, he said.